These Mission Style Clocks are authentic in style and finish to the Arts and Crafts movement of the late 19th Century. The simple designs of these mission style clocks focus on horizontal and vertical lines and flat panels that accentuate the grain of the solid Oak. This Mission style wall clock is finished in a Mission Oak dark finish. A parchment dial features dark brown numerals and hands. Decorative, wooden moldings frame the dial. Circular brushed brass swinging pendulum is antiqued and framed with wooden, reeded grilles. Quartz, dual chime movement plays Westminster or Ave Maria chimes, and features volume control and automatic nighttime shut-off option. Shadow collection - matching floor clock available. Size: H. 32-1/2" W.16-3/4" D.6"
Designed in the tradition of the Arts and Crafts Guilds, famous for their handcrafted, simple, honest, and pure design. Finished in Mission Oak dark finish. Shadow collection (Matching wall clocks available) Cream dial. Decorative wooden molding frame the dial. Wooden, reeded grilles accent the front lower door. Brushed brass weights and pendulum are antiqued, along with the front locking door accessories. Free engraved brass heirloom plate. Cable-driven, Westminster chime Kieninger movement offers a silence option. Size: H.79-1/2, W.25-1/2, D.14 in. The Bulova Mayfair wall clock is finished in an Antique walnut finish with a wooden frames front panel reminiscent of the Arts and Crafts movement. A metal Viennese dial is finished in white with easy to read black Arabic numerals. Swinging gold tone pendulum and rod. Triple-chime Harmonic II movement counts the hour plays Westminster, Ave Maria or Bim-Bam chimes on the hour. Adjustable volume control and night time shutoff. A 2.5 x .75 inch engraving plate is included. One year warranty and Free Shipping. 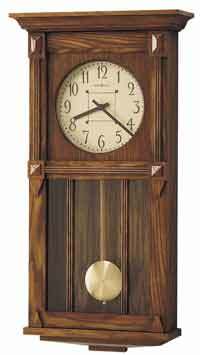 Size: H: 24" W: 11.5" D: 5.25"
Traditional Mission style wall clock in Mission Oak. Solid Oak wooden frame with an Ivory dial with black hands and quarter hour track. Glass crystal covers dial. Accurate Seiko Quartz movement uses one "AA" battery. One year warranty and Free Shipping. 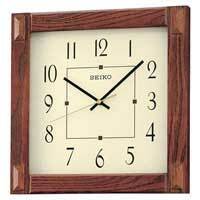 Authentic Mission style wall clock in a Mission Oak finish from Seiko Clocks. Stationary reeded front glass and mission style joinery. Swinging pendulum. Westminster/Whittington 4/4 quarter hour chime, hourly strikes, volume control, nighttime chime silencer. One "C" battery included. One Year Warranty and Free Shipping. Size: Height 25 1/4" x Width 12 1/2" x Depth5" 1/4"